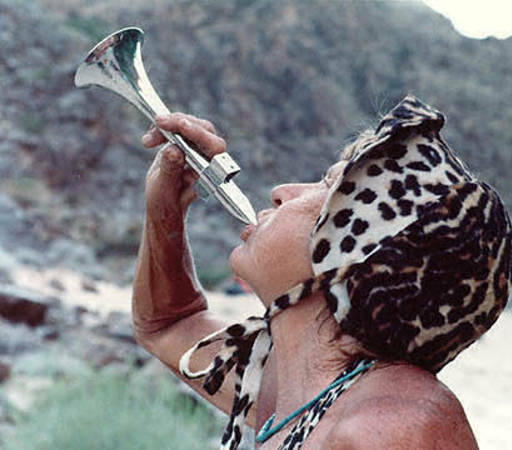 Georgie White Clark, born Bessie DeRoss, was the first woman to become a commercial river runner in the Grand Canyon. She also changed the pace of river running, opting to use rubber army surplus rafts and tying groups of three of them together to stabilize themselves whilst traversing rapids. She married her first husband, Harold Clark, in high school and had a daughter named Sommona Rose when she was 17. After working for a bit at Radio City Music Hall, the family decided to embark on a cross-country bike trip to California. They divorced shortly thereafter. Then, in 1944, her daughter was killed in a hit-and-run while they were cycling. She turned to hiking after her loss, cultivating a friendship with a fellow river runner and colorful character, Harry Aleson. The two decided to float down the river, beginning at Diamond Creek and ending at Lake Mead 60 miles down the river. She began leading her river trips in the 50s. Called “Georgie’s Royal River Rats”, her rafting enterprise was known for its accessibility and low costs, letting virtually anyone get their time on the river. She continued river running taking her last trip before her 80th birthday. She died from cancer at 81. Despite her thriving business, she had a tendency to take her customer’s safety lightly. The first commercial fatality and the first helicopter evacuation happened on her trips. Two women died in the span of Georgie’s career. Her legacy has since remained controversial. She had fiercely loyal friends and fans who protect her name beyond the grave while others openly criticize and condemn her methods. Twenty-four Mile Rapid was renamed Georgie Rapid in a 3-2 vote, something that was emblematic of her polarizing nature. [Georgie White Clark in Grand Canyon, Ariz.].